Super Monkey Ball and the first sequel were among my favorite games for the Gamecube. My family and I spent hours and hours getting those adorable little monkeys where they needed to be. The minigames, too, were a whole heap of fun. 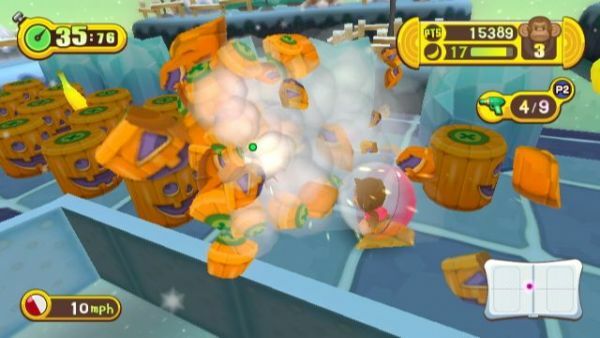 The Wii's Super Monkey Ball Banana Blitz just didn't have the same charm, for some reason. The newest game in the series, Super Monkey Ball Step & Roll, adds in co-op, which is certainly a step in the right direction. What form of co-op, you ask? Well, it appears that co-op takes the form of Super Mario Galaxy, where one player has all the fun, and the other player uses the Wii remote to shoot enemies. A more robust experience would be preferable, but when it comes to co-op, we'll take what we can get. Especially when adorable monkeys in hamster balls are involved. Page created in 1.9388 seconds.